Major area for rice cultivation and for sheep and goat raising; other crops include wheat, gram, rapeseed, sugarcane, and cotton. Shikarpur, the seat of civilization, culture, trade and commerce acquired political and economic importance because of its strategic location on the map of Sindh, being directly accessible to those who came from Central and West Asia through the Bolan Pass. . . . .
History dates back to the early 1617’s when this emerald city in the northern Sindh province of Pakistan became the nucleus of a historical trade centre on a caravan route through the Bolan Pass into Afghansitan. Shikarpur became the core of manufacturers including brass and metal goods, carpets, cotton cloth, and embroidery. Its great bazaar (covered because of the summer heat) is famous throughout Turkistan and southern Asia. The trade links of Shikarpuris were spread all over to Geneva, Rome, Iran, Iraq, Samarkand, Sumatra, Japan, Burma, Honolulu, etc. Because of this immense network of the trade links, Shikarpuris brought all their earnings to their own home town. Shikarpur once described by Taj Mohd. Sahrai as the Paris of Sindh in its heyday of glory. Some people think that Kalhoras’ cousins Daudpotas founded the city and was named Shikarpur because The Talpur Mirs were fond of shikar (hunting). While others point out that Shikarpur was there before the Talpurs arrived on the scene; for yet another, Shikarpur had always been a trading hub, and never a hunting lodge. Experts think that Shikarpur as Shakaripur – the ‘city founded by the conqueror of the Shakas’, the Seythians. In this correlation they point out that “Quetta” is known in Persian records as “Shakari Kot” – “the (border) fort built by the conqueror of the Shakas.” Later on it was known as “Koita” or “Kot”, which the British renamed it as “Quetta”. Dawood Potan built a mud fort around Shikarpur in the early days. It had eight gates Lakhi Dar, Hazari Dar, Hathi Dar, Khanpuri Dar, Karani Dar, Novshahro Dar, Wagano Dar and Sevi Dar. It had deep channels around these gates, which was later filled up by the Britishers and a Circular road was built over it. The remnants of the mud fort could be seen till 1940. The city was clean and well cemented with bricks and surrounded by greenery. Historically speaking, it is said that in the 17th century Shikarpur was in fact a land full of forests and a much-loved hunting ground (Shikar Gaah) of the Mirs. Because of its strategic location on the map of Sindh, Shikarpur developed trade and business with the world whose links extended to distant places. Seths of Shikarpur were all Hindus and their trade boomed with many countries; they were very clever and besides from Sindhi, they could easily converse in Pushtu, Balochi, Persian and other Indian languages. The populace of Shikarpur, were well dressed, on form and enjoyed life to the full. They used to go to foreign countries and make loads of money, which they used to spend on themselves, their hometown and on charity and welfare projects as well. No doubt, therefore there were many schools, hospitals, charitable institutions and welfare trusts. Shikarpur was described as the PARIS of Sindhi in its heydays of glory. But in the presen day it is a past memorial to its old glory. It was a city of uniqueness, ethnicity and culture, which was very distinct. The cheerful scenes around festivals, Sind canal, gardens with beautiful flowers, variety of food present had always people swarming all over with gaiety and glee. Sadly neither those people nor that vista can be seen today. Shikapuris were fond of classical music. Renowned and famous artistes from Sindh and India like Waman Rao, Patwardhan, Pandit Vyas, Omkarnath, Khan Sahib Mubarak Ali, Bade Ghulam Ali Khan, and singers like – Kajari Inayat Bai and Mukhtiar Begum, were invited to sing and the people used to listen and enjoy them for days together. Thakrudas Nagrani, Sessions Judge, Aga Sufi, Maharaj Tejbhandas and others established the first dramatic society – Dharamupkars Amateurs Society. There were numerous other places of significance. The important being ‘Dhak Bazar’ and ‘Shahi Baugh’. In fact, ‘Dhak Bazar’ was the architectural phenomenon. It was the longest marketplace covered with joinery (pure teak). ‘Shahi Baugh’ was the most beautiful garden with thousands of variety of flowers and the gazebo therein of Gothic lines of architecture. Lakhi-Dar was another place where on the sundown people would flock together to ramble, leisurely walk, eat, drink and make merry. As they state, while in Shikarpur, if one does not see Lakhi Dar, one has not seen Shikarpur at all. In fact, it was the nerve centre of the city. About religion Shikarpuris were devout and charitable by nature. There were various places of worship but Khatwari Darbar gained importance, as its originator was Baba Gurdas a Progeny of Sikhs, who had miraculous powers of turning sand into sugar. It is through the collective activities of mahants that it gained fame and recognition. These mahants daily distributed tons of grains to animals and birds and food to the underprivileged and disadvantaged of all religion alike. Even drinking water facilities were made available for animals at a lot of places in the city. Shikarpuris were therefore acknowledged to be bountiful and generous. In the field of literature also Shikarpur was in the vanguard. It produced vedantic titans like Saami, one of the three pillars, TRIMURTI – Shah, Sachal and Saami of Sindhi poetry. Shikarpur has produced the noteworthy contemporary poet of Sindh, Sheikh Ayaz whose role is also unmatched as it is exceptional. Pertaining to education, Shikarpuris were striding in front even in 1930. There were about 70 graduates in the city of Shikarpur in 1930; whereas, in the res of Sindh there were only 7 graduates then. 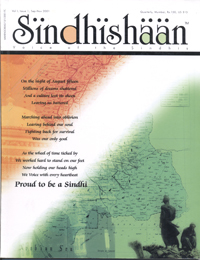 The primary Sindhi college, Satramdas Chellasingh College, was also started in Shikarpur. On the social and political front Shikarpur produced my pioneers. The first Sindhi lady of Shikarpur who was allied with Gandhiji’s Andolan was Gangadevi, who went to imprisonment a number of times. Besides Prof. Shewaram Pherwani, Tarachand Gajra and score of others were related with politics under the influence of Gandhiji. Shikarpuris are the pioneers of the financial instrument called ‘Hundi’, which was acceptable in different parts of the world and was considered as good as gold. Shikarpuris brought all their earnings to their own town and filled their homes with diamonds and other precious stones.